The Chinese lottery allows winners to remain anonymous so long as receive the prize in person in a ceremony broadcast nationwide. This has led many winners to use colorful costumes when receiving their prizes. 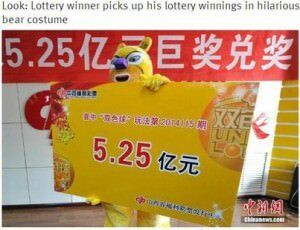 The latest winner, a man, came dressed up in a bear costume to collect a huge 520RMB jackpot from the Shanxi province’s welfare lottery. The winner said he had been spending 20,000 to 30,000 RMB per year in lottery tickets. Now he has enough money to buy lottery tickets for the next 1700 years or so.